Over the years, I've transitioned from a strong hatred of basil to a solid like of it. As much as I enjoy it though, it's hard for me to take in large quantities. I've always been curious about substituting other greens for basil in pesto, and it turns out that using spicy, peppery arugula instead is just the right substitution. If I do say so myself. While I was at it, I substituted almonds for the traditional pine nuts and threw some gorgeous heirloom tomatoes into the mix too. All of the produce in this dish came from my local farmers' market, and the result was everything I'd imagined it to be. Each flavor came through on its own but they also played well together. The sauteed mushrooms were a special treat for me since the mushroom hater of the household was out of town when I made this. In fact, I'm pretty sure this is mushrooms' big debut on Playing House. 1. In a large skillet, sauté the almonds in a little olive oil until toasted. Let cool, then blend them in a food processor or blender until they are in coarse pieces. (“The size of orzo,” the original recipe suggests.) Scoop them out of the processor and set them aside. 2. Put the arugula, garlic and a few pinches of sea salt into the food processor and chop. Add the almonds back to the food processor with the tomatoes, cheese and olive oil and whirl briefly. Season it with freshly ground black pepper. 3. Cook pasta until it is al dente and could use another minute of cooking time. 4. While the pasta is cooking, heat the butter in a medium skillet. Once the butter is melted and bubbling, add the mushrooms and saute until color has darkened and size is reduced by about half. Set aside. Reserve one cup of pasta cooking water and drain the rest. Immediately toss the hot linguine with the pesto and mix quickly so that it drinks the sauce up a bit. 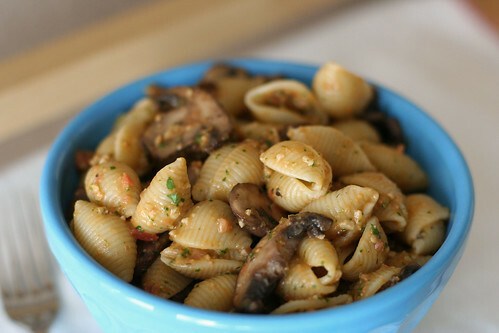 Toss with mushrooms. Add more pasta water if needed. Serve and enjoy! Ooh, I would never have thought to use arugula. I'm not a huge pesto fan so this could be an option! Yum, what a delicious pesto idea! Yay for Pesto without pine nuts! !